The E3S Awards Competition is the gold standard for identifying state-of-the-art projects in environmental engineering and science. Get the recognition and exposure your projects deserve! The submission process is entirely electronic, allowing you to submit your completed entry directly online. Judging is also conducted electronically with an unlimited geographic representation of judges. Completed entries for the E3S Awards Competition must be uploaded by February 1, 2019. You may submit the reservation form at any time, but it is advised that you submit your reservation form prior to the February 1st deadline to allow time to review instructions for, and test, your secured drop box. For entry forms and guidelines, go to http://www.aaees.org/e3scompetition/. Communicating with the public at large and other constituents can be a complex and challenging issue. Communication and marketing plans must be designed to address the objectives and strategies of the campaign to reach a target audience. With this in mind, AAEES is proud to offer this area of competition and invites consulting firms and municipalities alike to enter. Completed entries for the EComm Awards Competition must be uploaded by March 1, 2019. You may submit the reservation form at any time, but it is advised that you do so early to ensure that you have sufficient time to review instructions for, and test, your secured drop box before the March 1st deadline. For entry forms and guidelines, go to http://www.aaees.org/ecommcompetition/. The 2018 Annual Meeting of the Board of Trustees will be held at the Wood Environment & Infrastructure Inc. office at 3755 South Capital of Texas Highway, Suite 375, Austin, Texas on Friday, October 26. The Installation Dinner will be held at the Austin Marriott South, Austin, Texas on October 25, 2018. The AAEES room block is at the Austin Marriott South. The BoT meeting begins at 8:00 a.m. Friday, October 26th. The President's Reception and Installation will be held the evening of Thursday, October 25th. For more information and registration, go to http://bit.ly/2018AAEESFallBoT. Reminder to Committee Chairs - President-Elect Kris Morico is anxious to receive your recommendations for new committee members and/or chairs to replace those whose terms expire in December 2018. The Academy is seeking volunteers who are interested in helping the Academy through its network of committees. Committee appointments are for three-year terms. Please email your recommendations and letters of interest to "the attention of President-Elect Kris Morico" either via email, at JSOlmo@aaees.org or via postal mail to Academy Headquarters * 147 Old Solomons Island Road * Suite 303 * Annapolis, MD 21401, at your earliest convenience. For a list of committees and committee members, click here. The recertification audit is moving a little slow. Please remember your documents and form can be submitted online to JDowen@aaees.org. If you are a Life Active member and have been selected for the audit, you still have to meet the professional development hours. If you have any questions, please contact Joyce Dowen at 410-266-3311. If you are a Life member, you still need to renew your certification. You will need to answer the questions about your P.E. license and your PDH's. If you no longer meet the PDH requirement, you can always become Life Inactive if you still have your P.E. license. The 2019 Specialty Certification process has started, and we still have members who have not renewed for 2018. If you need assistance, please give Joyce Dowen a call at 410-266-3311. 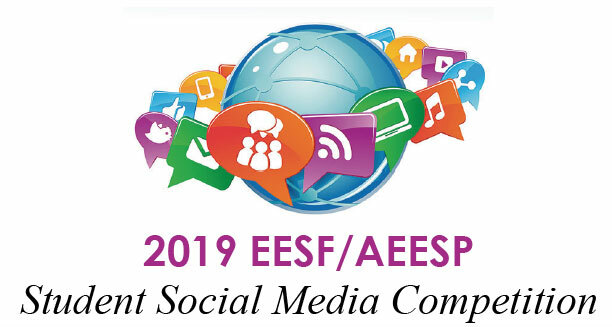 The Environmental Engineering and Science Foundation and Association of Environmental Engineering and Science Professors are pleased to announce the 2019 EESF/AEESP Student Social Medial Competition. The theme is: Use Social Media to educate students and the public about the role of Environmental Engineers and Scientists in meeting the "grand challenges" facing our nation and the world. This competition is open to undergraduate and graduate students. For details, go to http://www.eesfoundation.org/student-social-media-competition/. Increasing pressure from growing populations, climate change, extreme weather, and aging water-related infrastructure threaten water availability and quality in the United States and abroad. As a result, research to help inform decision-making related to the management and use of water resources will be of paramount importance in coming decades. The Water Mission Area (WMA) of the U.S. Geological Survey (USGS) has a long-established reputation for collecting and delivering high-quality, unbiased scientific information related to the nation's water resources. At the request of the USGS, this report identifies the nation's highest-priority water science and resources challenges over the next 25 years, summarizes WMA's current water science and research portfolio, and recommends strategic opportunities for WMA to more effectively address the most pressing challenges. Challenges identified include understanding the role of water in the Earth system, quantifying the water cycle, developing integrated modeling, quantifying change in the socio-hydrological system, securing reliable and sustainable water supplies, and understanding and predicting water-related hazards. High-priority questions that need to be answered cover the quality, quantity, and spatial and temporal variability of atmospheric, surface, and subsurface water; the impact of human activities; comprehensive water accounting; effects of climate change; and long-term water-related risk management. It's easy and free to host an Academy Workshop or Seminar in your locale - If you would like to learn more, please email Workshops and Seminars Chair, Sharon Yin, syin@ocsd.com, and copy JSOlmo@aaees.org. Be sure to give an approximate date and suggested topic (if any), possible speakers, and possible location. For three easy steps to hosting an event, click here. October 18, 2018 - AAEES Annual West Coast Event at UCLA. This year's topic is In This Era of Climate Uncertainty; Is SoCal Ready to Invest in Sustainable Local Water Resources? Register online now at http://bit.ly/2018WestCoastConference or click here to download and distribute the registration flyer. This event sold out last year, so reserve your space now! October, 24, 2018 - FREE AAEES Live Webinar: Los Angeles Aqueduct - Owens Lake Environmental Protection and Dust Mitigation Project. 12 noon EST. Click here to register today.